Oct. 10, 2018: Bronco fans will be treated to some exciting games this weekend as The Bronxville School celebrates homecoming. The lights will be on at Chambers Field, and the teams are scheduled to play from Thursday through Saturday. Homecoming week opened on Tuesday with Battle of the Banners on the front lawn and will include the traditional team parade and bonfire tonight. Food trucks will be at the Meadow Avenue parking lot on Thursday evening during the JV boys' soccer and JV football games. 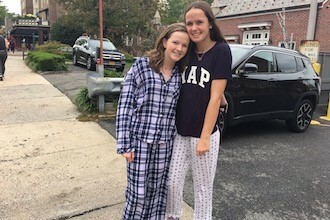 Two high students dress for pajama day during homecoming week. Photo by J. Murrer. The Bronco regular fall season will end a week from today, and then many of the Bronco teams will move on to playoffs. Below is a look at how the varsity teams have fared in the last week. The girls' tennis team defeated Edgemont and Keio this week, clinching the league championship. 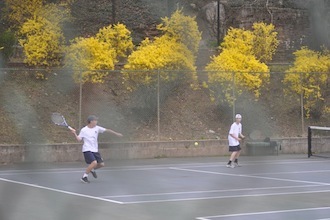 The Broncos were tied with Edgemont 3-3 in the first match, and doubles players Katie Formato and Rory Christian were down a set and down 1-5 in the second set when the game was called because of darkness. When they resumed a week later, Formato and Christian had an amazing comeback, winning the second set and the tiebreaker. The Broncos also won their second match against Edgemont with wins by Lindsey Cruikshank, Alexandra Brumbaugh, Susie and Sarah Goodell, and Olivia Doyle and Isabella Patterson. Brumbaugh, the Goodells, and Doyle and Patterson were undefeated in the regular season. The team will play in the Section 1 Team Tournament on Saturday. 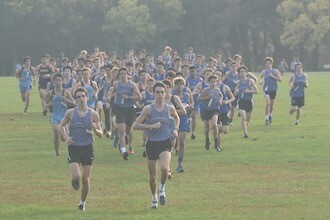 The individual conference championships started yesterday. Competing for Bronxville in singles is Brumbaugh and in doubles are Eva Dani and Cruikshank, Formato and Christian, and the Goodell sisters. The Bronxville girls’ swim team. Photo by D. Galimi. 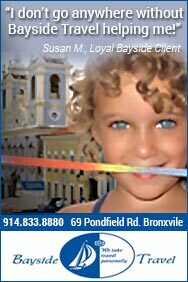 The Bronxville/Tuckahoe girls' swim team (4-2) had a solid 84-93 win last Friday over Croton Harmon/Hen Hud/Somers. Finishing first for the Broncos were Tuckahoe's Emily Gjersten (200IM, 500 free), Alisa Fominykh (50 free, 100 butterfly), and Julia Bazinet (100 back). The 200 free relay team (Ellie Dessart, Fominykh, Caroline McGrath, and Gjersten) also placed first. Fominykh and Nina Veru are the captains this season. The Broncos swim the power division against teams such as John Jay and Horace Greeley and will swim against Ursuline on Friday at Sarah Lawrence. The Bronco girls are the top-ranked team in Class C and are also a force to contend with among all teams in Section 1. They are ranked No. 4 in the LoHud Power Rankings, and their current record (10-3) is misleading, as their three losses came at the hands of the top teams in Section 1, Lakeland, Mamaroneck, and Scarsdale. The team played Irvington (8-0) and Valhalla (8-0) and on Friday played Albertus, winning 1-0. The Broncos will play Pleasantville at homecoming on Saturday at 2:30 pm. The Panthers (8-1) have not had as strong a schedule as the Broncos but are ranked No. 8 in the LoHud Power Rankings. The girls' soccer team is 10-2 on the season with wins over Rye Neck (5-1) and Blind Brook (7-1) last week. The team lost to a tough Pleasantville squad 1-0 last Tuesday and will face the Panthers again in the upcoming playoffs. The Bronxville girls' soccer team is ranked No. 2 in Class B behind Pleasantville and will face Somers on Friday at 5:15 pm. The Tuskers are ranked No. 6 in Class A. The Broncos are a young team after graduating 16 seniors last year and are currently 9-4 with a 1-0 win over Red Hook on Monday. Competition within their league is intense as they play against state-ranked Rye Neck (No. 2) and Blind Brook (No. 24). They lost 1-0 in overtime to Blind Brook last week and will face Rye Neck this afternoon. At homecoming, the Broncos will play Westlake (0-8-1) on Friday evening at 7:00 pm. The first round of playoffs starts on October 19. The cross country league championships at Van Cortlandt Park yesterday. Photos by Charlotte Rizzo. 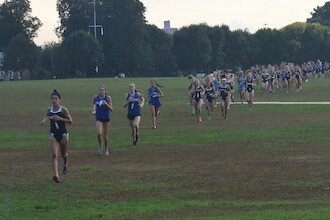 The Broncos competed in the league championship yesterday at Van Cortlandt Park. Natalie Weiner won for the girls and Alex Rizzo won for the boys. While the Broncos have yet to win a game this season, they played very close games against Woodlands, Pleasantville, and Putnam Valley. This year, the weaker teams in Class B broke off and formed an independent league, resulting in a much more competitive Class B league. The Broncos will face Ardsley (6-0) on Saturday night at 6:00 pm. Ardsley sits at the top of Class B and has outscored its opponents 217-61 so far this season. 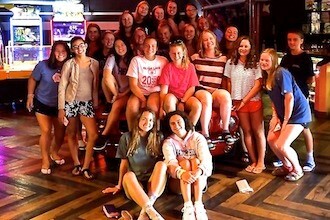 The combined Bronxville/Mount Vernon volleyball team is a new varsity sport this fall. The team will play Mamaroneck at 4:30 pm on Friday at Mount Vernon High School. Click here for another MyhometownBronxville article about homecoming. * Times are for player introductions before the game. 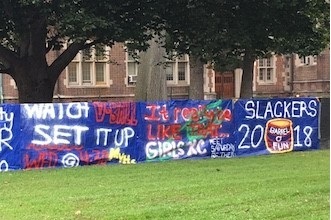 Pictured at top: Battle of the Banners on the front lawn of the school.